to increase in recent decades - and they continue to rise. Check out the global average temperature chart / counter below. 97-98 percent of climate scientists agree that there is sufficient evidence that human activity is warming the planet. Because of climate change, the world's average temperature could rise by up to 6.4 degrees Celsius (11.5 Farenheit) during the 21st century. The Intergovernmental Panel on Climate Change has six scenarios for the development in global mean temperature with increases from 1.1 to 6.4 degrees celsius in the 21st century. We use an average projection of 3.75 degrees. The University Corporation for Atmospheric Research: WHAT IS THE AVERAGE GLOBAL TEMPERATURE NOW? 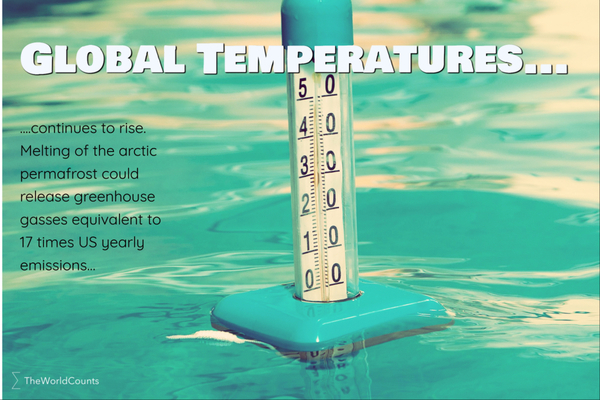 Interested in more facts like the global temperature? Then plug in and subscribe to our newsletter.